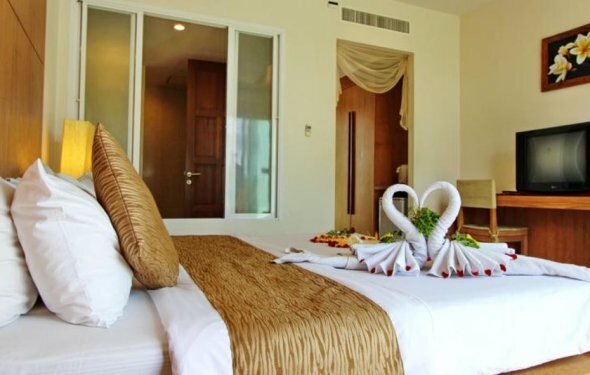 Here at Delight Villas Kata Beach is the Place where you can enjoy the sun, peace, tranquility, and natural beauty Bordered by the golden sands and gentle waves of the Andaman Sea, Delight Villas at Kata Beach, Phuket is an oasis of peace and tranquility. A tropical paradise of extraordinary natural beauty. Exuding seclusion, luxury and romance, this exotic hideaway boasts only the finest views and ambience. A 'Land of Smiles' indeed under the sheltering canopy of attentive European Management and friendly Thai service personnel. Delight Villas Kata Beach is a special place with just twelve "Deluxe Villa" rooms and four "Superior" rooms for happy and uncomplicated vacationing. All right next to the Ocean. Each Villa overlooks the unique, majestic beauty of Kata Beach offering elegant living in harmony with nature. Right from your balcony you have an undisturbed view to the azure blue Andaman Sea ... watch mind boggling sunsets and catching cool breezes throughout the entire year. Delight Villas Kata Beach is a secluded and peaceful place, within walking distance to shopping- and entertainment centers. Surrounding Coral Reefs offer great opportunities for snorkeling, swimming or diving - All in pristine clear waters.